"Spirit of the Three Fires"
I am Zhaawano Giizhik, Marten Clan, a writer and a jeweler and graphic artist inspired by the oral and pictographic narratives and lessons of my Anishinaabe ancestors - and, by extension, the works of Anishinaabe en Cree artists who paint in the contemporary tradition of the Native Woodland School of Art. 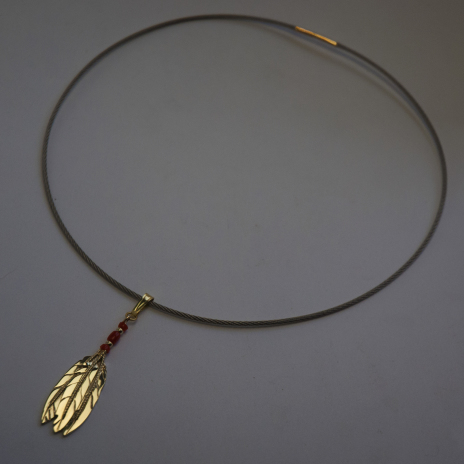 This blog story is the fourteenth already in a series titled Teachings Of The Eagle Feather, featuring my art (jewelry, mostly) along with works of art by kindred artists. Both my stories and the jewelry/artworks displayed seek to provide an insight into the old and venerable worldview of the Anishinaabe Peoples. 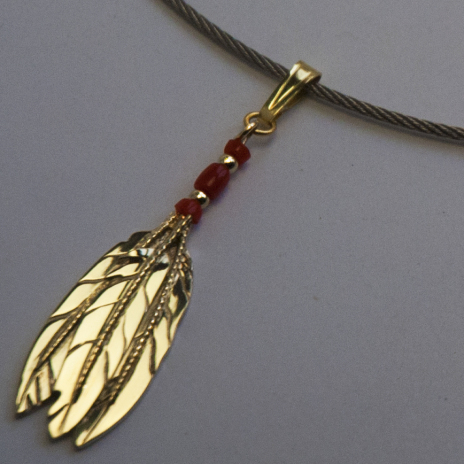 Today's story introduces two new gold eagle feather necklaces and a bolo tie designed and handcrafted by myself. Also, two beautiful canvases painted by second-generation Anishinaabe Medicine painters Leland Bell and Simone McLeod serve as illustration for the story . 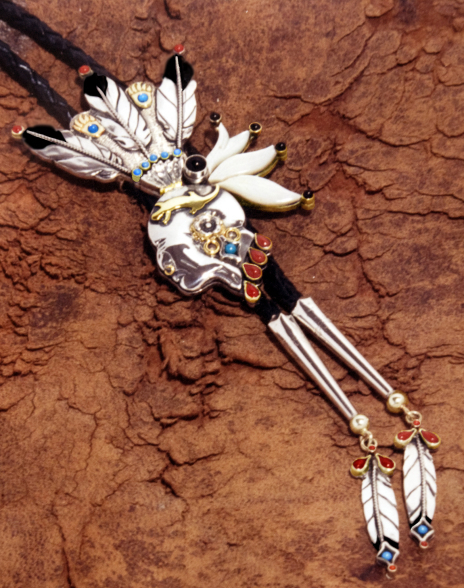 Leland Bell's painting and the pieces of jewelry that you find in this blog post refer to an important historical milestone in Anishinaabe history (the founding of the Three Fires Confederacy) and also carry symbols of Anishinaabe spirituality pertaining to a sacred set of guidelines, often called Seven Grandfather Teachings. These Nizhwaaswi Gagiikwewinan, which are considered a part of Gichi-dibaakoniwewin, the Great Binding Law of the Great Mystery, became the foundation of Midewiwin spiritual practice as we know it today. Illustration: Makwa from Simone McLeod's Animal Series. death, and that unless he provided them with the Sacred Medicine they would soon become extinct. Between the position occupied by GICHI-MANIDOO and the earth were four lesser manidoog with whom GICHI-MANIDOO decided to commune, and to impart to them the mysteries by which the Anishinaabeg could be benefited. So he first spoke to a manidoo and told him all he had to say, who in turn communicated the same information to the next, and he in turn to next, who also communed with the next. They all met in council, and determined to call in the four wind manidoog. After consulting as to what would be best for the comfort and welfare of the Anishinaabeg, these manidoog agreed to ask GICHI-MANIDOO to communicate the Mystery of the Sacred Medicine to the people. GICHI-MANIDOO then went to GIIZIS the Sun Spirit and asked him to go to the earth and instruct the people as had been decided upon by the council. GIIZIS, in the form of a gwiiwizens (little boy), went to the earth and lived with a woman who had a little boy of her own. This family went away in the autumn to hunt, and during the winter this woman’s son died. The parents were so much distressed that they decided to return to the village and bury the body there; so they made preparations to return, and as they traveled along, they would each evening erect several poles upon which the body was placed to prevent the wild beasts from devouring it. When the dead boy was thus hanging upon the poles, the adopted child—who was the Sun Spirit—would play about the camp and amuse himself, and finally told his adopted father he pitied him, and his mother, for their sorrow. The adopted son said he could bring his dead brother to life, whereupon the parents expressed great surprise and desired to know how that could be accomplished. Noos gaawiin anishinaabewisii, ayaawiyaan manidoo ningwizis. Bi-mayaa-miniik niiji-manidoo mayaa zhigwa ji-gi-aawiyan. bimaadizid mii omaa; niijii-manidoo mayaa zhigwa ji-giiweyaan. (“My father is not a human. I, a son, am a Spirit. Just as - my fellow Spirit - you now are. The THREE FIRES CONFEDERACY, or THREE FIRES COUNCIL is a long-lived political and military alliance of Anishinaabe peoples. According to the sacred birch bark scrolls of the Midewiwin, about 1200 summers ago after reaching the southern shores of Miishii'iganiing (the Michigan lakes) and Mishigamiing (Lake Michigan) on their migration westward from from the shores of the Great Salt Water in the east (Waabanakiing, the Dawn Land), the Waabanakii Nation – or, as they had started to call themselves, Anishinaabeg or Spontaneous People -, became lost and their once strong sense of oneness shattered, and they split in a northern and a southern branch. The core Anishinaabe peoples, belonging to the southern branch, formed the Council of Three Fires and migrated from their "Third Stopping Place" near the present city of Detroit to their "Fourth Stopping Place" on Manitoulin Island, along the eastern shores of Georgian Bay. The three groups that began to emerge from the southern branch of Waabanakii migrants were the Ojibweg, the ‘Older Brother’ and keepers of the Midewiwin Religion; the Odaawaag (Odawa) or Trader People, the ‘Middle Brother’ responsible for trade and sustenance; and the Bodwewaadamiig (Potawatomi), the ‘Younger Brother’ who came in charge of the Sacred Ancestral Fire from the East Land. (Sometimes a fourth group, the Misi-zaagiwininiwag or Mississauga, is distinguished but they are generally grouped with the Ojibweg.) Around 800 CE, these three or four groups formed for mutual protection a loose confederation, called Niswii-mishkodewin (Three Fires), and all three Nations moved into several areas around the Great Lakes, in what is now Michigan State and Ontario. Although the Niswii-mishkodewin had several meeting places, Michilimackinac (an island between Lake Huron and Lake Michigan) became the preferred meeting place because of its central location. From this island, the Council met for military and political purposes and maintained relations with fellow Anishinaabeg including the Mamaceqtaw (Menominee), the Asakiwaki (Sac), and the Meskwakihaki (Fox), as well as with a myriad of other Nations such as the Haudenosaunee, the Dakota, the Wyandot, the Ho-Chunk (Winnebago), and, later in history, the Wemitigoozhiwag (France), the Zhaaganaashiwag (England) and, eventually, the Gichi-mookomaanag (the United States). Although the idea of the Council was directed toward maintaining balance of power within its own Anishinaabe communities and keeping peaceful relations with surrounding Nations, unresolved disputes regularly erupted into wars, notably with their most bitter enemies the Kanien’kehaka (Mohawk) and Onyota’a:ka (Oneida) of the Haudenosaunee/Six Nations Confederacy who constantly threatened them from the east and the Dakota, the Ho-Chunk, and the Meskwakihaki, inveterate enemies from the south. In the olden days, before the Europeans invaded Anishinaabewaki and destroyed much of Anishinaabe identity, the Midewiwin was integrated in all facets of Anishinaabe life. The Midewiwin lodge was the source of Anishinaabe governance, its influence largely instrumentalized through the doodem (clan kinship) system. A great deal of visionaries and healers of the Midewiwin were active not only in the spiritual, but also in the political domain; particularly in the context of the Three Fires Council. Because of their exceptional powers and skills and their knowledge of the Seven Grandfather Teachings, when the Ojibweg were confronted with the European and American military powers and settlers encroaching and flooding the borders of Anishinaabewaki, the Mideg were looked upon by their communities as apt political leaders, advisers, and decision makers fit to represent their People in trade and treaty negotiations with the Zhaaganaashag (British) and Gichi-mookomaanag (Americans) – and thus earned and achieved the kind of status, prestige, and authority that was otherwise only reserved for hereditary ogimaag (chiefs). It was, and still is, commonly understood that the survival of the Three Fires, and the Anishinaabeg as a whole, their cultural values, and their traditional organizational community/doodem (clan) structures depend a great deal upon the ability of high-ranking Mideg – with Nooke doodemag (bear clans) leading the way - to deal with the military and political powers of the Europeans and Gichi-mookomaanag and with the gigantic political and environmental challenges that faced - and still face - the entire Anishinaabe Nation. The Three Fires Council is still very much alive today, not only politically but also in a spiritual/religious sense; the Three Fires Midewiwin Lodge, a contemporary movement of the Midewiwin Society, was inspired by the historic Three Fires Confederacy. Its contemporary function is often described as a movement of spiritual revival, maintenance, and strengthening of the original Teachings, Rituals, Ceremonies, and Prophecies of the Anishinaabeg; all vested in in the Midewiwin, the Original, Historic Anishinaabe Lodge of the Good Hearted Ones that has its origin in the ancient Dawn Land. The ceremonies take place in a spiritual place called the Mide-wiigaan or Midewiwin Lodge. The Mide-wiigaan, a gift from the benevolent spirit/human Wiinabozho to the Anishinaabeg, is typically an elongated framed structure made of maple saplings with openings on the eastern and western ends (see below image). Nowadays, Indigenous nations such as the Mamaceqtaw (Menominee), Ojibweg (Ojibwe), Odaawaag (Odawa), and Bodéwadmik (Potawatomi), who consider themselves as the Anishinaabe People, as well as other Native nations, partake in the annual ceremonies of the Three Fires Midewiwin Lodge. The revival of the Midewiwin Lodge is in accordance with the Seven Grandfather prophecies and teachings, spiritually delivered to the Anishinaabe people long before the predicted arrival of the Europeans on the east coast of Turtle Island (North America). 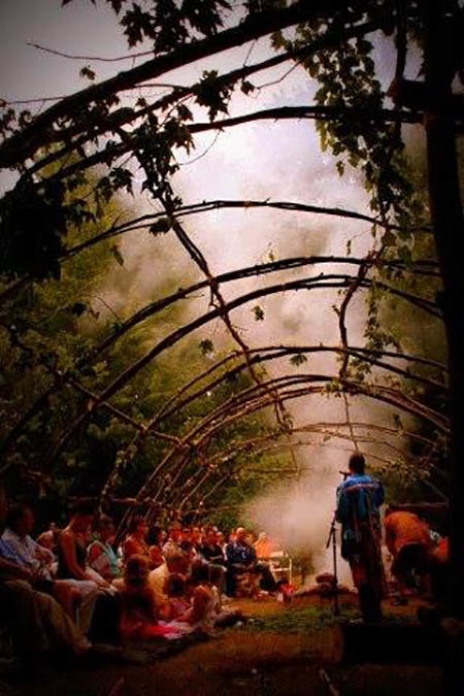 Like the ancient Midewiwin, the Three Fires Midewiwin Lodge is considered a sacred place, both earthly and in the Spirit World, that was given to all Spontaneous People (Anishinaabeg) by Gichi-manidoo. 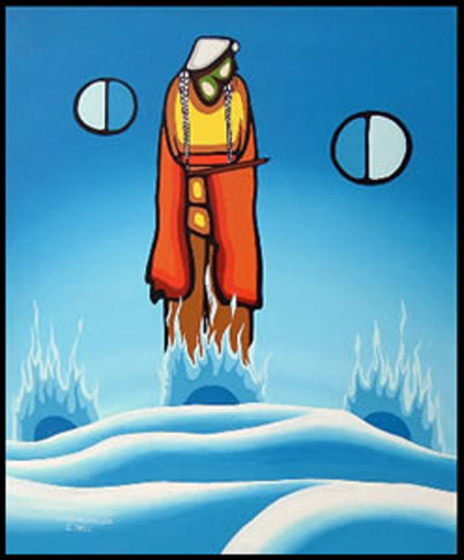 The Three Fires has two interrelated meanings: on an earthly level it signifies the political brotherhood of Ojibweg, Odaawaag and Bodéwadmik; on a spiritual level it refers to Mind, Body, and Spirit. The Three Fires Mide Lodge is presided over by the Spirit, called Mide Manidoo, in the form of Midewewe’igan (also called Mitigwakik), the Grandfather Water Drum. 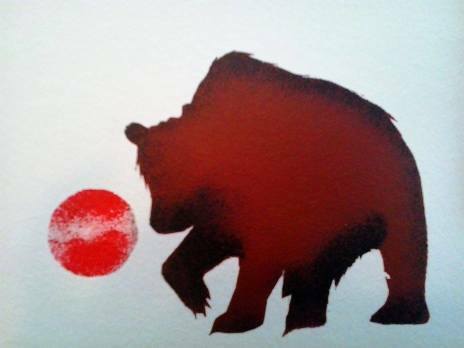 The Grandfather is supported by Oshkaabewis, his ceremonial helper, called the Little Boy Water Drum in reference to the above-told origin story of the Midewiwin that says that a little bear boy descended from the Sun and remained for some time among the Anishinaabeg to teach them the mysteries of the Midewiwin. Members of the Three Fires Midewiwin Lodge are initiated into the various levels of the Midewiwin (eight in total), and come from across the Turtle Island (North America). The Three Fires Mide members meet in fellowship frequently, mainly at the four seasonal ceremonies which are held in Anishinaabe communities throughout Anishinaabewaki, the land of the Anishinaabe Peoples. Giiwenh. 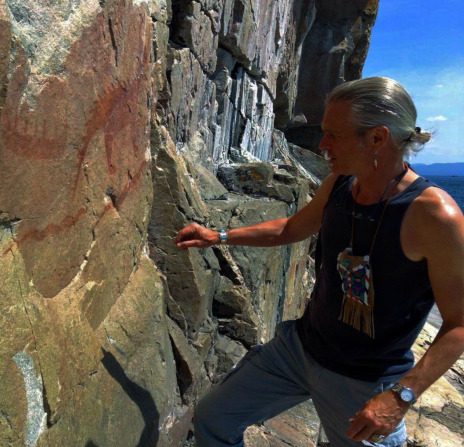 So the story goes about the origin of the Three Fires of the Anishinaabe Peoples and, along with it, my jewelry and paintings of kindred artists that reflect the spirit of the idea behind the Council and the Lodge of the same name. Miigwech gibizindaw noongom mii dash gidaadizookoon. Thank you for listening to me today. Giga-waabamin wayiiba, we hope to see you again soon. Click here to read the next episode of the series, which features a wedding ring set titled "Seeing in a Spirit Way" as well as paintings and a poem by kindred artists. * Sources: ZhaawanArt Blog and Wikipedia. *** Source: Bob Goulash Anishinaabe Blog.